We recently had SYNLawn installed on our balcony and backyard and we couldn't be happier with the results. Since our backyard is in a wooded area, our lawn was more moss that grass, SYNLawn was the perfect solution. 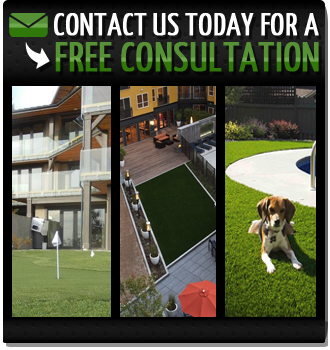 The SYNLawn looks so much like natural grass that our Real Estate agent thought we had just laid down new sod. The balcony transformation is also amazing and now looks more like a rooftop garden than just a deck. The service we received from start to finish was terrific and we're singing SYNLawn's praises to all of our friends. Thanks Chris and crew for a great home makeover!